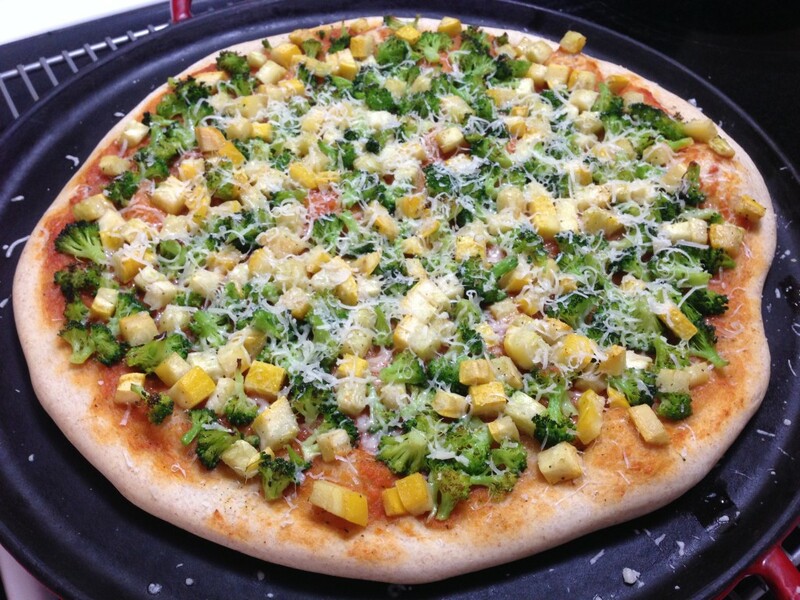 Homemade pizza dough, leftover tomato sauce, CSA broccoli & squash, and farmer john’s parmesan cheese. Cooked at 450 for 13 minutes on our pizza stone. What could I call this soup? Cabbage soup? Blah. Bean and Cabbage soup? Double blah. Highlighting the tomatoes and spice? Sure. That will work. Unfortunately, I don’t have a very precise recipe for you on this nutritious and delicious way of using up a smallish sad, unwanted CSA cabbage. But, here’s a play-by-play of what I did. In the pre-market days, I used a adaptation of this recipe for my cabbage stew, using rotel for picante, lightlife soy crumbles for beef, and water for beef broth. I figured I’d use it as a rough guideline, but needed a way to replace “ranch-style beans”. What are ranch style beans anyways? For that, we ask an expert. After reading through homesick texan’s recipe, I remembered that I had an enchilada sauce sitting in the freezer which tasted strongly of ancho chilies… so strongly that I used it once for chilaquiles and never again! Time to shine again, baby. So, in the future, I may follow homesick texan’s recipe more closely, but for now, here’s how I made the beans. On Saturday, I cooked 1.5 c of dry pinto beans. Having never cooked dry pinto beans, I had no idea about the specifics. Soak or not? Salt or not? Simmer forever or a 30 minute boil? It turns out that pinto beans are more like lentils than black beans. I couldn’t have soaked for more than an hour, and it was probably too much. I will still soak them, but for no more than 30 minutes in the future. I didn’t salt them, but I probably could have. Then, I let them boil away for IDK how long (I know, super useful). But they couldn’t have taken more than 2 hours to cook, and probably were done in 1, again with not a ton of soaking. They were probably done earlier, since mine were mushy when they came off the stove. Then, I stirred in a few tablespoons of my enchilada sauce, added some brown sugar and chile vinegar (Savory Accents!). From there, I took a simple approach to the stew. My beans were already overcooked, so I just need to cook my cabbage to the texture I wanted and add in the beans. I sauteed an onion and some garlic and added two cans of tomatoes (leftover from the old days, a jar of salsa would have been a nice substitute), some chili powder, cumin, and oregano to taste, and the cabbage. I simmered until the cabbage was all wilty and buttery and just the way I like it. Add the beans in, added more chili powder and salt to taste and voila! 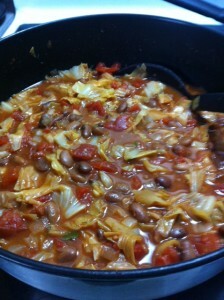 A spicy, but fairly light, cabbage and bean stew! I hesitate to give nutritional info on this, since I measured almost nothing. But, beans are a great lean source of protein and are the only contributors of carbs, and the only fat is the oil for the onion (and in my case, the oil in the enchilada sauce). That makes this a filling but very low calorie meal. We each ate a big bowl of it, so I think this will make 4 servings for us. If we’d added meat, it would have easily been 6 servings. So, where did the beef/soy go?, you might ask. I toyed with adding some ground beef or lamb. Neither of us felt like eating meat this week, so I did not. But perhaps next time, now that we know it is a success! Here it is. 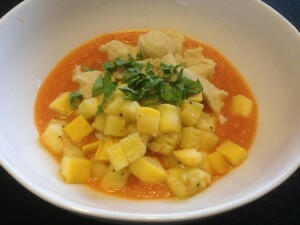 Ricotta dumplings with quick-sauteed summer squash in a homemade tomato sauce. Don’t let the lack of color fool you. This was a perfectly well-rounded summer meal. Now, I’ve used a recipe very similar tomato sauce to this many times in the past. So, here’s the big question in my mind: Is using fresh tomatoes better than using canned tomatoes? Of course, our Canopy tomatoes are not only local and fresh, but also grown in a body-healthy way and free of any dangers of canned tomatoes. But, for less than $7.30, surely I could have found organic, glass bottled or “BPA-free” tomatoes at the grocery store? Maybe you’re thinking: don’t the fresh tomatoes taste much better? Well, they taste different, that’s for sure! 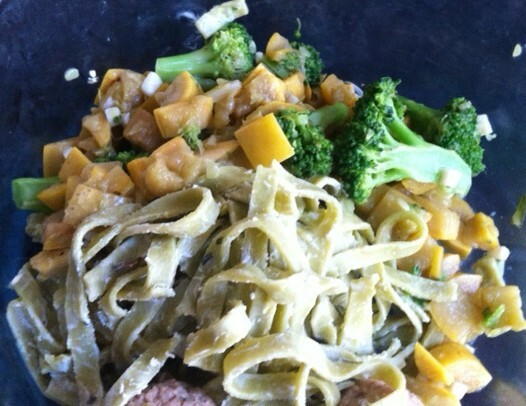 (I mean, look at how orange that sauce is!) This fresh tomato sauce was just cooked for a mere 45 minutes. And it still tasted of fresh tomatoes – sweet and just a little tart. I added little to it – not even salt and pepper, just a bit of basil. It was a great accompaniment for the summer squash and light, fluffy dumplings. My only complaint is that is sure was a lot of work… and it was a totally different sauce than the rich sauce that I typically make with the canned stuff. So, I don’t know that I can really say that it was “better”, just another delicious sauce. But wait! There is perhaps an even yummier alternative. Thus far, I have shunned the $6 and $7 market marinaras, except for the one time I bought one that I decided was better as a tomato curry (weird, but true). However, since the total cost of my sauce was more than that anyways, it looks like it’s time to rethink market marinara! At any rate, this was a delicious meal. The ricotta dumplings were a lovely alternative to pasta (and a great way to use up a bit of leftover ricotta!) and the summer squash was salty sweet and wonderful. We grated just a little bit of fresh parm on top and it was perfect for a summer Saturday.